Explanation: This gorgeous image of Orion shows off the constellation's young stars and cosmic clouds of hydrogen gas and dust. Made with a film camera tracking the stars on November 11, the exposure lasted some 40 minutes. It includes the Great Orion Nebula (near center), a string of well-known nebulae leading upwards to Orion's three belt stars, and the large semi-circular arc known as Barnard's Loop that seems to end at the bottom right, next to bluish supergiant star Rigel. Serendipitously, the picture also recorded a bright, comet-shaped cloud not known to share the sky with Orion's famous stars and nebulae. Also spotted by other skywatchers, the mystery cloud was quickly recognized as a fuel dump from a booster rocket used to place a satellite in geosynchronous orbit. 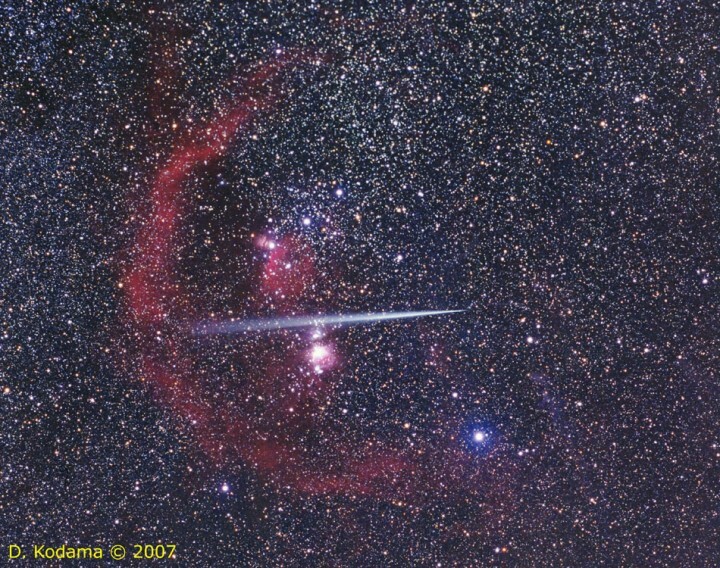 Reflecting sunlight, the fuel dump plume begins on the west (right) side of the star field and expands as it slowly drifts eastward and fades during the time exposure, creating the wedge-shaped streak.